Backyard “Cutthroat” Croquet (every person for her/himself) is by far the most common version of the game played in America. It is a simple game with a few key strategies to win, so it is easy to understand and play effectively. Note that almost all modern versions of the game are played in teams of 2 against 2, and this may be something you might try instead of “every man for himself”. Teams can be formed in pairs for doubles play or in singles each player plays 2 balls. If the order of rotation is blue, red, black, yellow: then the teams would consist of blue/black against red/yellow. Each player on a team tries to help out their partner by joining up with them in strategy (and on the court). 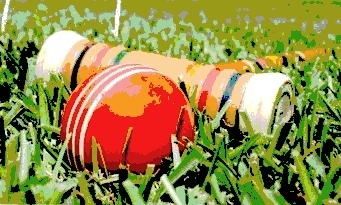 With Cutthroat, essentially the object of the game is to be the first to score all the wickets in the correct order and hit the finishing stake at the end. The player who does that first wins the game. Use the Basic Rules for setting up the court, use of the mallets, the start and bonus shots. The order of play is determined by the colors on the stakes (Blue, Red, Black, Yellow, Green, and Orange). We recommend putting the six (or less) balls in a bag and have players pull them out without looking to determine who plays which color. Send opponents ball away- This keeps them from getting extra bonus strokes or going through wickets. Gang up on the lead ball- Unfortunately this is used quite often by players who are behind to prevent the lead ball from staking out and winning. Run as many wickets in a single turn as possible- build a 3 or 4 ball break by sending opponents ball into a useful position on the other side of a wick, for example, to be hit again for additional extra strokes . See Four Ball Break. On the website, there are Challenging Options you may pick and choose from if you want to add a bit more challenge. One common Challenging Option is Option 7. Poison . This stretches out play because the winner is not first to finish by hitting the stake, but the player who “poisons” all the other balls. Poison gives less skilled players an opportunity to knock the better player out of the game. The USCA 9 Wicket Group stands ready to answer any questions you have.